Tres leches, move over. There’s a new cake in town with three iterations of the same component: tres (or maybe it should be trois?) 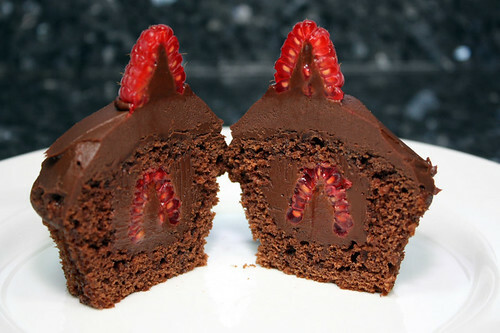 ganaches chocolate raspberry cupcakes. Sounds decadent, right? Well, they were. Decadent, extravagant, and definitely delicious…if possibly slightly unnecessarily complicated. This entry was posted in Baking and Pastry, Featured and tagged chocolate, Cupcakes, ganache, raspberry on June 28, 2009 by Jessica Petersen. Here’s today’s central question: should the words “fruit-flavored” and “pasta” ever go together? This is not a question I would have pondered without a concrete basis in real life, but I got to find out the answer anyway. A few weeks ago, Chris came home from work and presented me with two paper bags from the Pappardelle’s Pasta stall at Pike Place market. 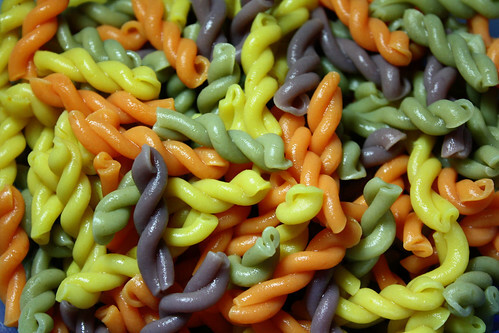 One contained lemon parsley mafaldine, which were wide, frilly noodles with flecks of bright green. Okay, sounds good, right? But the second bag I wasn’t so sure about. A fanciful fruit pasta blend sounded like just another weird food Chris was trying simply because it was a weird food. He also brought home a recipe for a fruit salad using the noodles from the stall with him, and he was very keen to try both the pasta and the recipe. Every night he mentioned wanting to make it, so finally I rounded up all the ingredients for him one day and had them waiting when he got home. The noodles were…surprising. I was shocked that I didn’t hate them. That’s not to say that they weren’t weird, but as far as fruit-flavored pasta goes, I’d imagine this wouldn’t rank half-badly. I was impressed that the colors stayed so vibrant after being cooked, proudly declaring whether they were lemon, lime, tangerine or raspberry flavored. The texture was good and robust, and I was charmed by the shape, which I thought looked like two separate noodles twisting into a close embrace. I kept coming back to try them again and again while Chris chopped up the fruit for the salad. My expectations rose. Really, they weren’t half bad. I could see them working in a light fruit salad, and they certainly were striking. 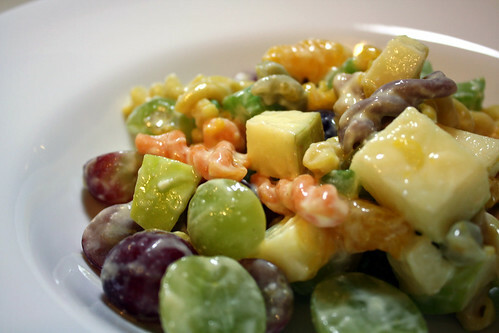 Chris added the celery (the recipe calls for way too little celery) and the fruit–apple, mandarin orange slices, and halved red and green grapes–and tossed it with the pasta, and it really looked quite pretty. Maybe I was actually going to like this stuff. Unfortunately, it didn’t look quite so appetizing once the yogurt-based dressing showed up at the party. But it would still taste good…maybe? Not so much. The flavor of the noodles seemed quite strident when we were eating them on their own, but it was completely masked by the fruit and the dressing. To make matters worse, the mandarin orange slices and the orange juice concentrate mixed in with the yogurt made the whole thing taste candy-sweet, artificial and harshly acidic. Chris and I both got through our portions for dinner that night, trying not to waste food, but the one and only bite I took from the bowl I served myself the next day brought the word “inedible” to mind. The best we could figure is that the company was trying to appeal to the church picnic crowd, not foodies, and came up with a recipe that would echo the fruit salads of yore. We still had the lemon parsley noodles to try. I had much higher hopes for them. Chris blanched some gorgeous asparagus and made a sweet onion sauce to go on top. This time I was even more disappointed. 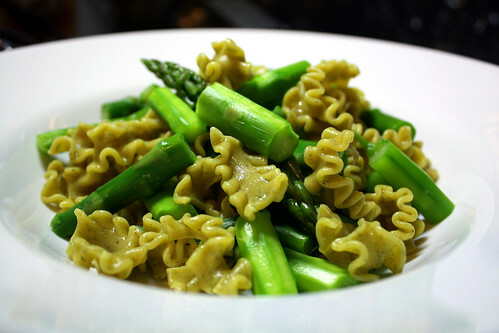 The dish certainly wasn’t inedible–the asparagus and the sauce were both spot-on, so that helped–but there was something off about the lemon flavor in the pasta. Chris finally put a name to it when he pointed out that they were using lemon oil to flavor the pasta, which made it taste like lemon oil rather than fresh lemon, and that tone of lemon flavor actually worked much better with the fruit-flavored pasta. 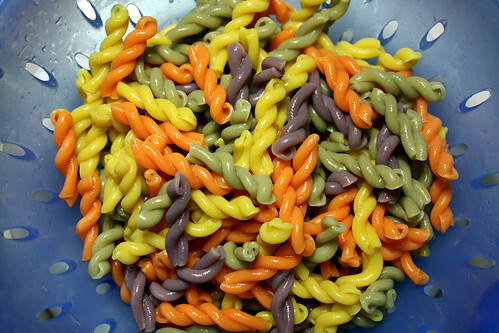 In the end, I wouldn’t buy the lemon parsley stuff again, but I might give the fruit-flavored pasta another chance. Only this time with my own recipe. Fresh orange slices rather than canned mandarins would help, as would a much less overpowering dressing. The walnuts and light, crisp apples could make a repeat appearance, and I think we decided that the right goat cheese would counter the fruit flavors nicely. However, if I find myself wanting bright, flashy pasta, I think I’ll try out this wicked pasta dish Greg posted at Sippity Sup yesterday, where the beets in the dish turn the fusilli bright neon red. This entry was posted in Cooking, Reviews and tagged apples, asparagus, celery, grapes, lemon, lime, oranges, parsley, Pasta, raspberry, tangerine, yogurt on March 25, 2009 by Jessica Petersen.